Long, simple, clear notes, they seem to trail off in the distance. Almost shyly played, as if the saxophonist wanted to approach what she wants to say very tenderly. 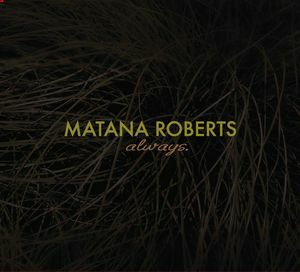 After her solo album Coin Coin Chapter 3: River Run Thee Matana Roberts presents herself with an entirely different approach of playing alone. While River Run Thee also included electronics, spoken word poetry, singing and all kind of samples, Always is stripped down to the single voice of her alto. And what a great saxophonist she is! Always displays Roberts’ roots in Chicago's AACM and recordings by fellow artists like Anthony Braxton and Roscoe Mitchell. As in a stream of consciousness Roberts seems to look for a topic, a recurrent theme, a plan she wants to follow for the next 33 minutes (the length of the first track). She wanders through the history of great black music, standing on the shoulders of giants like Lester Young and Ben Webster as well as John Coltrane and her idol Fred Anderson. Especially in the second track these giants are joined by the ghosts of Albert Ayler. Roberts’ music is the blues of the South, the call and response structures of the gospel, folk music – and everything is bathed in deep melancholy. You can recognize bebop licks, blues riffs, staccato rhythms, free jazz runs and balladesque craving. It’s a communication with herself, a masterful private meditation, it’s about looking for an original sound – on the one hand. On the other hand it is also possible to understand this album as a socio-political comment on the situation of African-Americans in the USA, knowing that Roberts comes from a background of black consciousness and radicalism that has always tried to combine modes of social justice and creative freedom. Besides this album and her Coin Coin project Roberts has also established a work in progress space called Black Lives Matter All Lives Matter, which refers to the movement that was founded in 2013 after George Zimmerman, the man who killed Trayvon Martin, was acquitted. And even if Always was recorded on May, 14th, 2014 (which means before what happened in Ferguson after the shooting of Michael Brown and the incident in Baltimore when Freddie Gray died while being in police custody), it clearly is a statement on the fact that African-Americans have always suffered from police brutality more than white Americans. Roberts’ music meanders between wailings and mournful cries, it is angry and furious (especially “Untitled Nr. 2”), melancholic, exhausted, disrupted and desolate. The references to musical history (from tonal and almost beautiful melodic parts to wild outbreaks and back) also show that there has been a long history of violence. Always is an album of great intimacy, yet it transcends privacy. 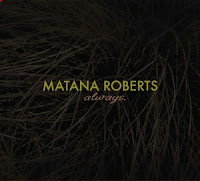 Matana Roberts is the voice of her generation – at least as to jazz. You can buy the album from the label or from Instant Jazz. This sounds like an everyday rehearsal of someone practicing techniques in sax improvisation. Nothing new nor exciting can be heard here. Not even virtuosity. Just straight tones and scales.